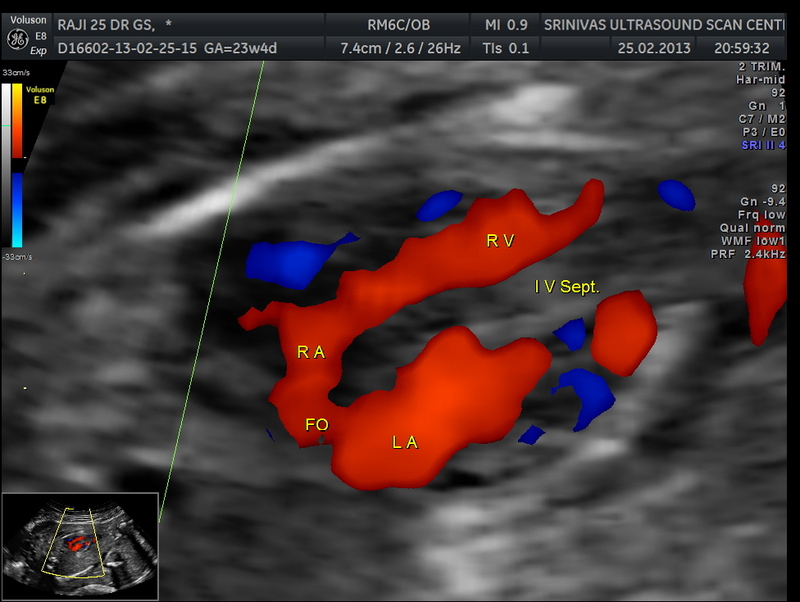 This was a 25 year old primi , without a history of consanguinity , sent for 2nd opinion for suspected dilated ventricles . 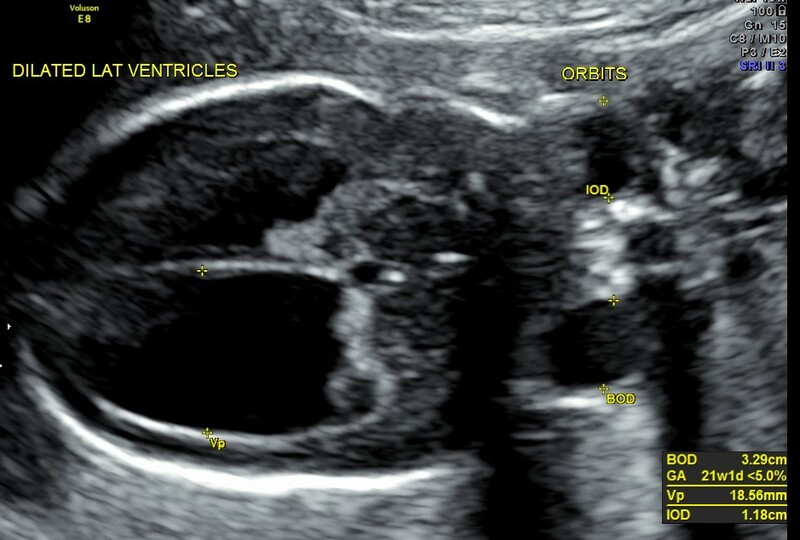 The following pictures show dilated lateral ventricles and orbital hypotelorism ( meaning an abnormal decrease in the distance between the two eyes (the eyes appear too close together)). in the first picture. 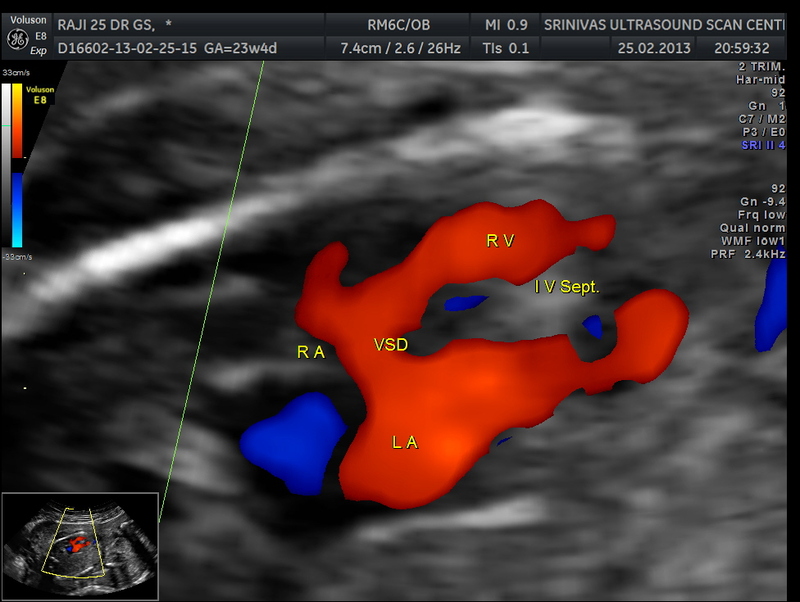 Angulation reveals semi-lobar holoprosencephaly. (occipital horns are seen , but other ventricular landmarks are absent ). 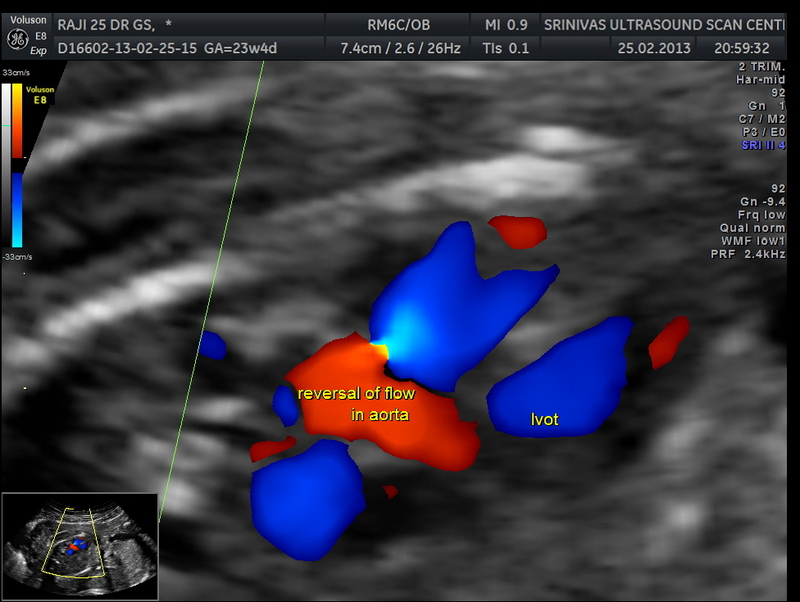 The fetal head was in the upper pole , with the spine posterior in location throughout the study.The spine was studied with great difficulty . 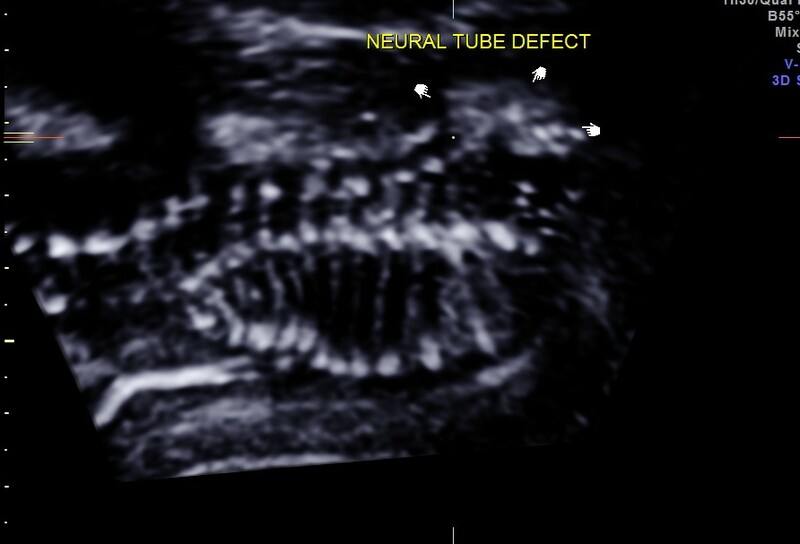 This was a flipped image showing a neural tube defect.- lumbar meningo myelocele. In right atrial isomerism, both atria of the heart are morphological right atria leading to associated abnormalities in the pulmonary venous system. In addition, individuals with right atrial isomerism develop asplenia, a mid-line liver, malrotation of the small intestine and the presence of two morphologic right lungs. Individuals with left atrial isomerism, by comparison, two morphologic left atria, polysplenia, have intestinal malrotation and two morphologic left lungs. 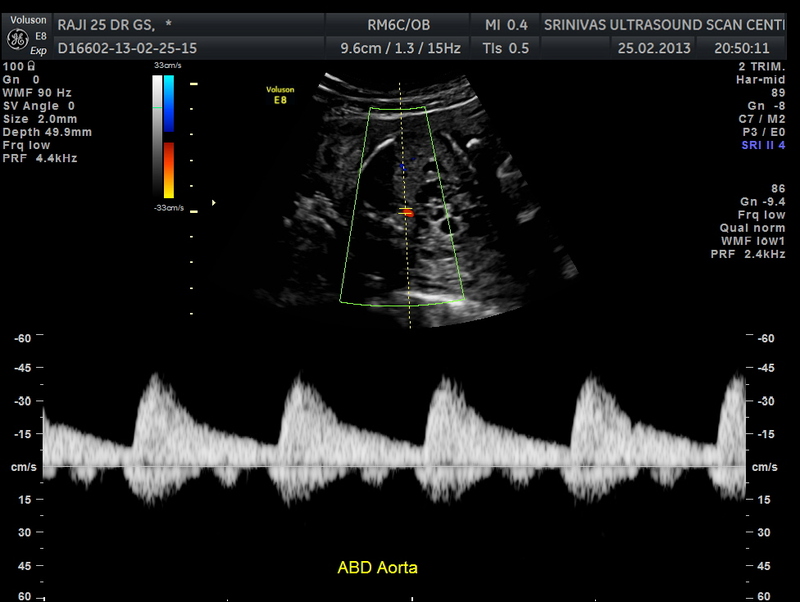 spectral doppler showing aortic flow (above ) and ivc flow ( below image ). 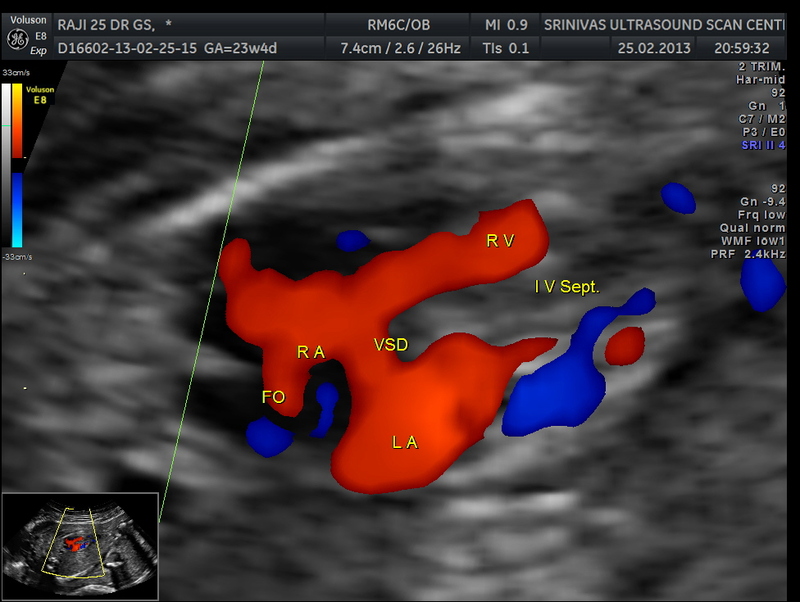 the following colour flow image shows no obvious abnormality. 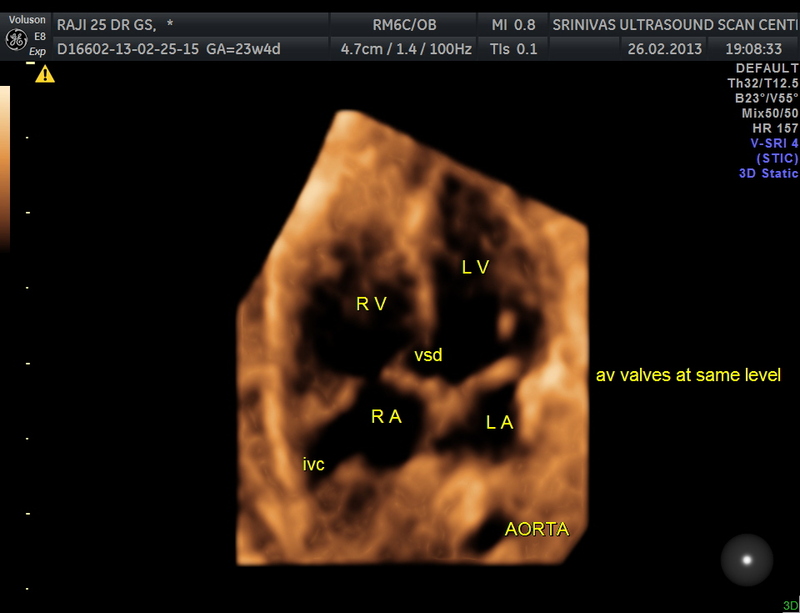 The following video shows all of the above cardiac findings .please watch careful. Because of the oligohydramnios , visualisation of face , limbs and digits was not good. So the diagnosis offered was – bilateral renal dysplasia, holoprosencephaly , neural tube defect, complex heart disease ( heterotaxy , vsd ). 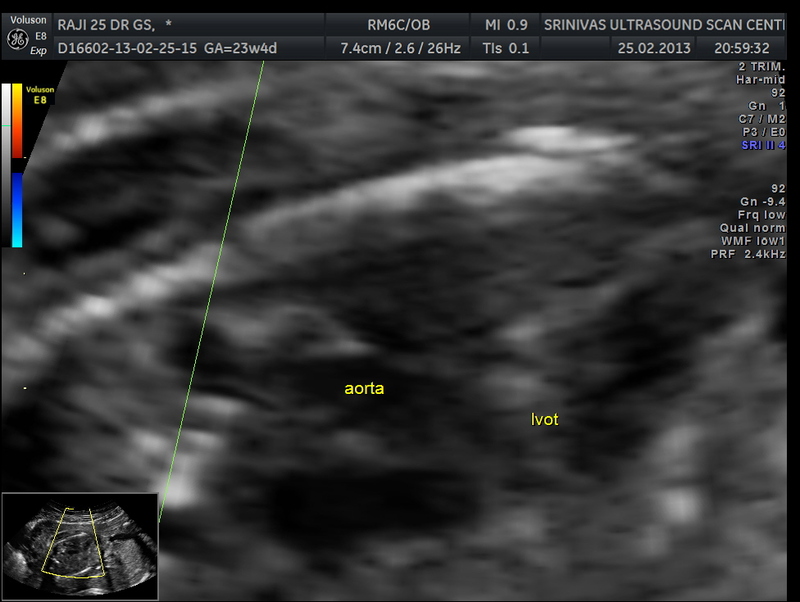 Coarctation of aorta was thought of later on examination of the saved images and clips later. 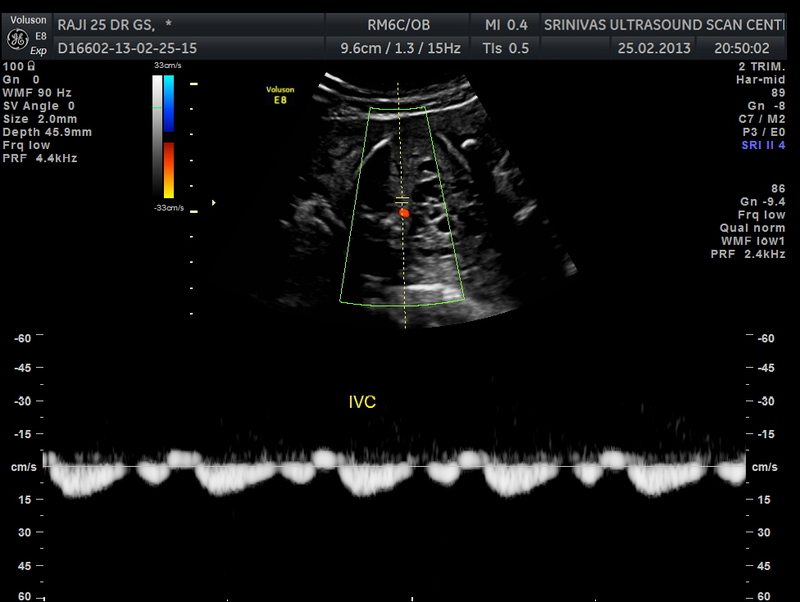 Did the baby have a diaphragmatic hernia also? I don’t agree with the diagnosis of this being a case of holoprosencephaly. Even in mild forms of holoprosencencepahly the frontal horns are fused together. They are not fused in this case. This in all likihood is a case of severe ventriculomegaly (hydrocephalus) and fenestration of the the falx, due to the severe ventriculomegaly. Discussions and disagreements are a healthy part of a scientific blog . Please read my other posts and give your opinion . It was a pleasant surprise to see your comment on my blog. The 3rd picture is a 3D picture and the dot is in the midline and shows the connection. 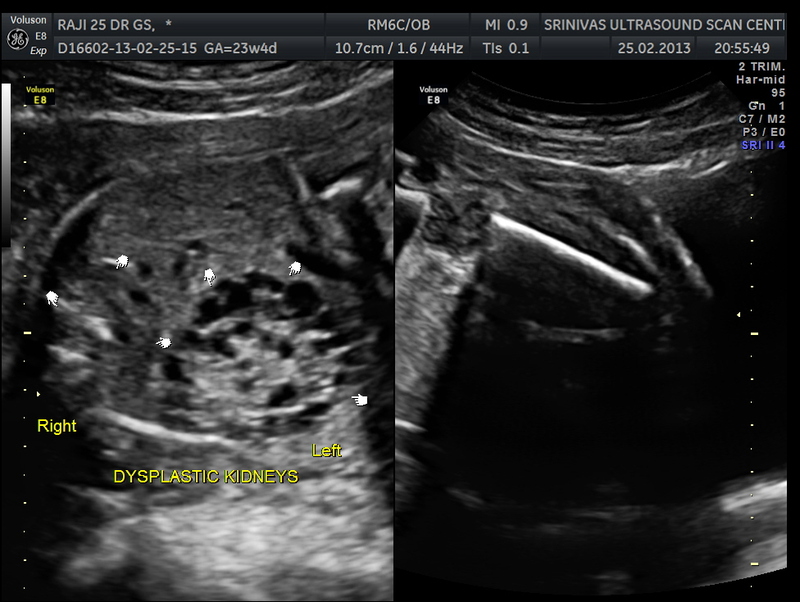 I do agree the 1st picture shows only ventriculomegaly. Thanks for your interaction . 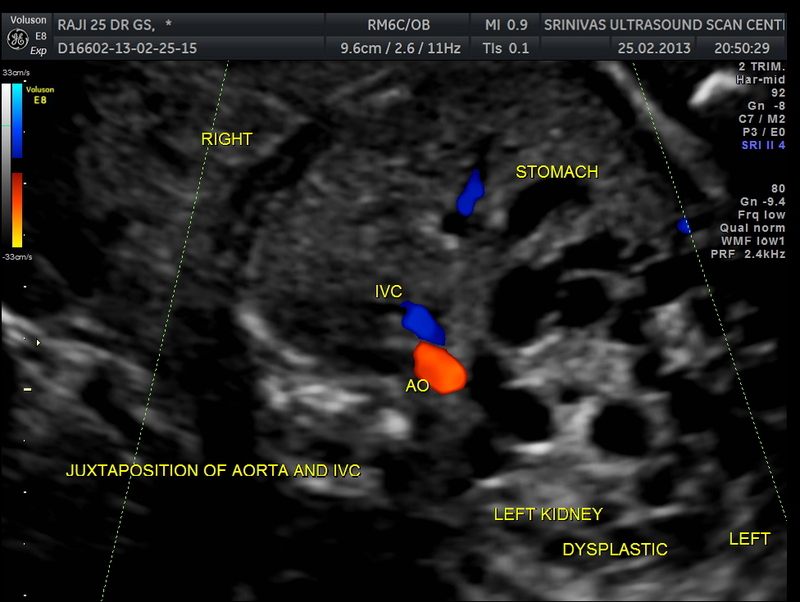 Were you ever able to obtain an etiology for the abnormalities (amniocentesis? microarray? other testing?). 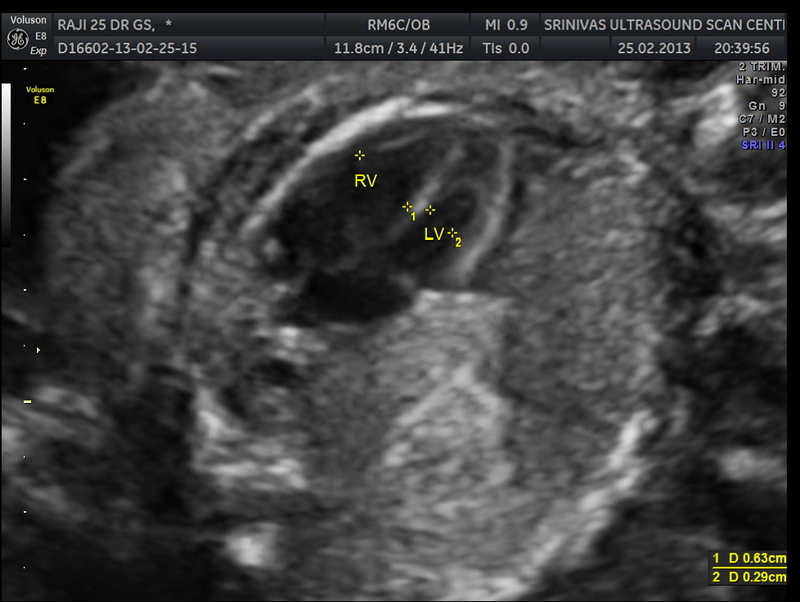 We have a similar patient with semilobar holoprosencephaly, heterotaxy, hypoplastic right ventricle, unilateral renal agenesis, also with an absent nose and midline cleft lip and palate. 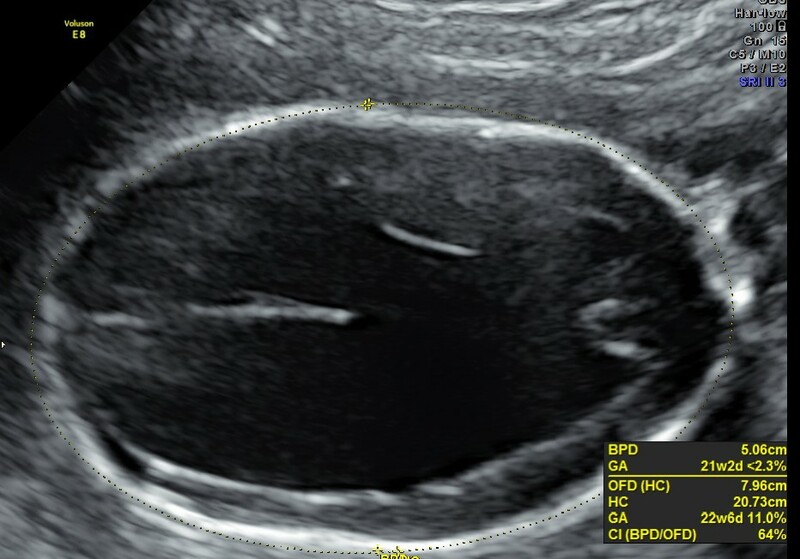 Amniocentesis is normal. Microarray results are pending. Thanks! 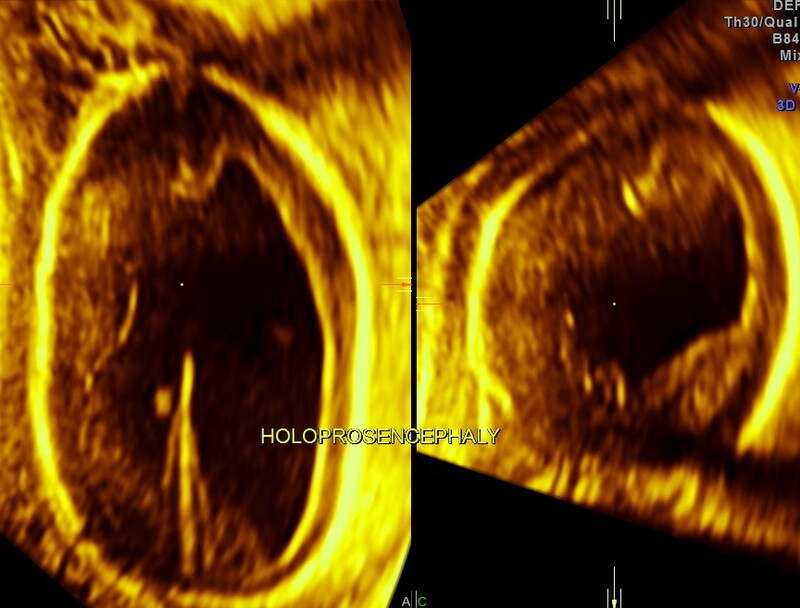 We found a case of holoprosencephaly in INM who survived eleven weeks.